Happy Monday!! I can't believe we hit 10,000 Facebook likes over the weekend! 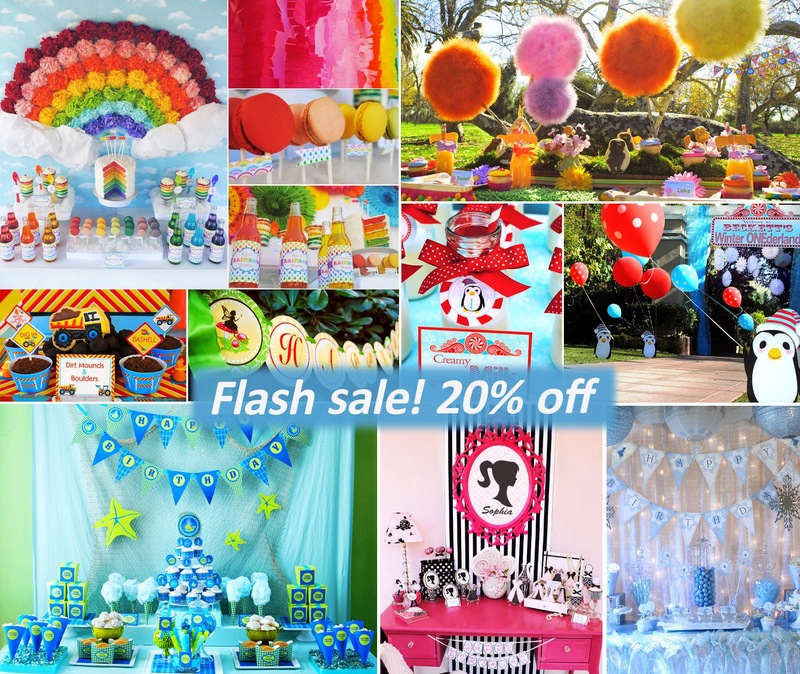 To say a HUGE thank you, we're having a FLASH SALE. 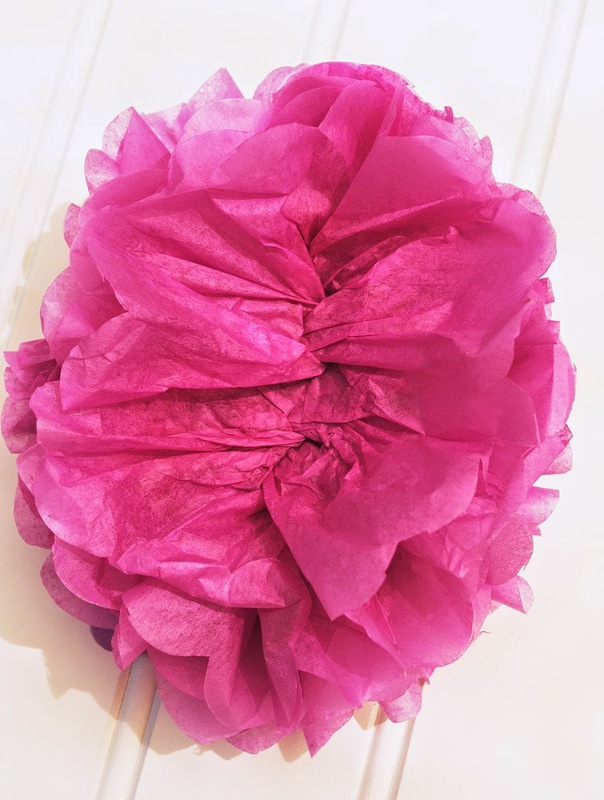 Just enter the code THANKYOU10K at check out and you will receive 20% off your entire purchase from my shop. My oldest recently lost his first tooth. Which meant that the Tooth Fairy had to come visit our house for the very first time! Yikes! The first thing I noticed is those teeth are darn little. 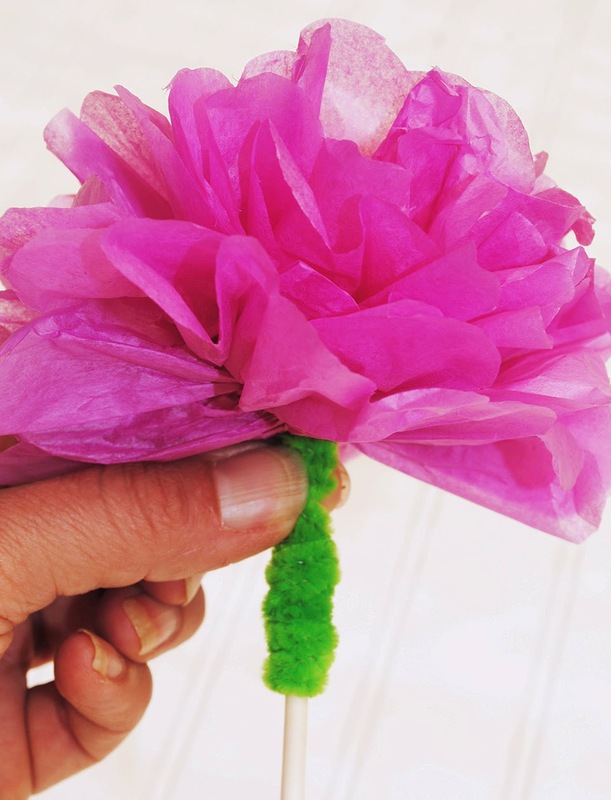 And being the (somewhat) conscientiousness mother that I am, I was terrified that the Tooth Fairy would not be able to find that little thing as hard as she might search without rousing my peacefully sleeping child. Oh the horror! 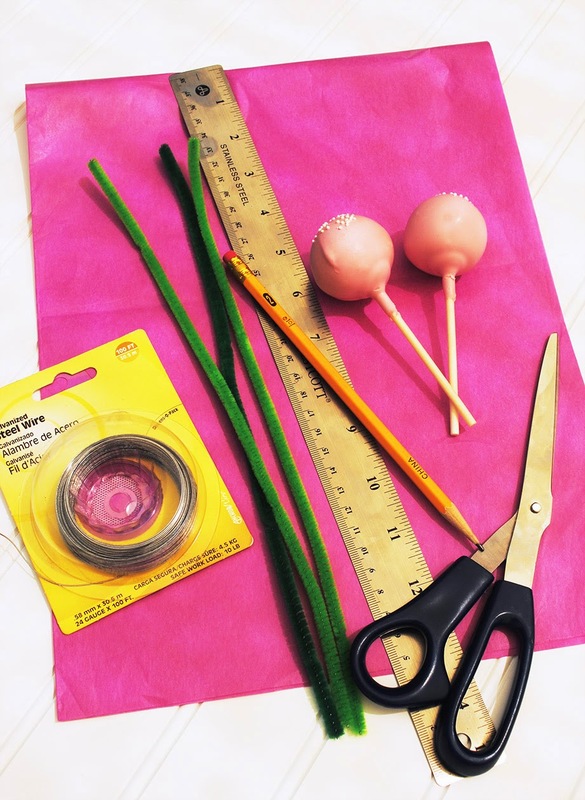 Sooooo I decided to create a special bag to hold the tooth as it would be a much bigger target for the Tooth Fairy. If you too are looking for a simply way to aid your local Tooth Fairy, you can download the Printable PDF here. I have upload the design in both Pink and Blue, your choice. It worked wonders in our house and my son was oh so delighted, the next morning, to find that it had been refilled with a few gold coins! 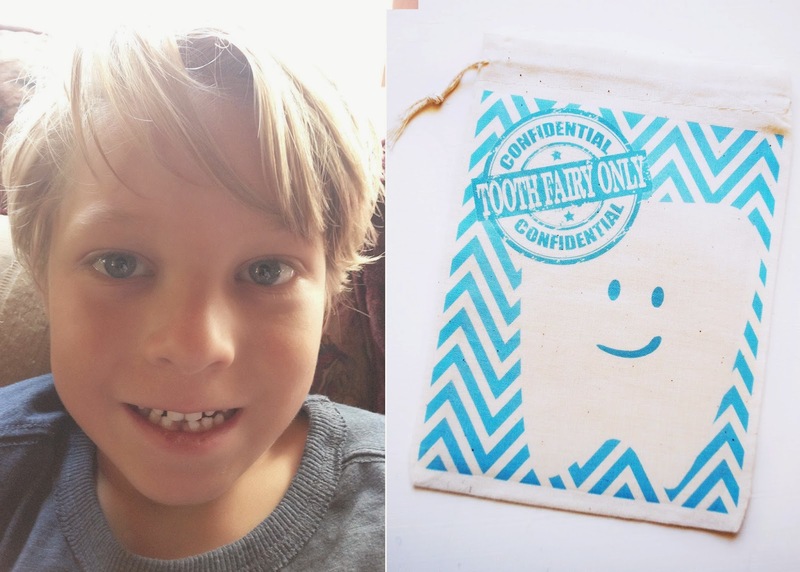 I hope that it will help you also have a blissful Tooth Fairy experience. 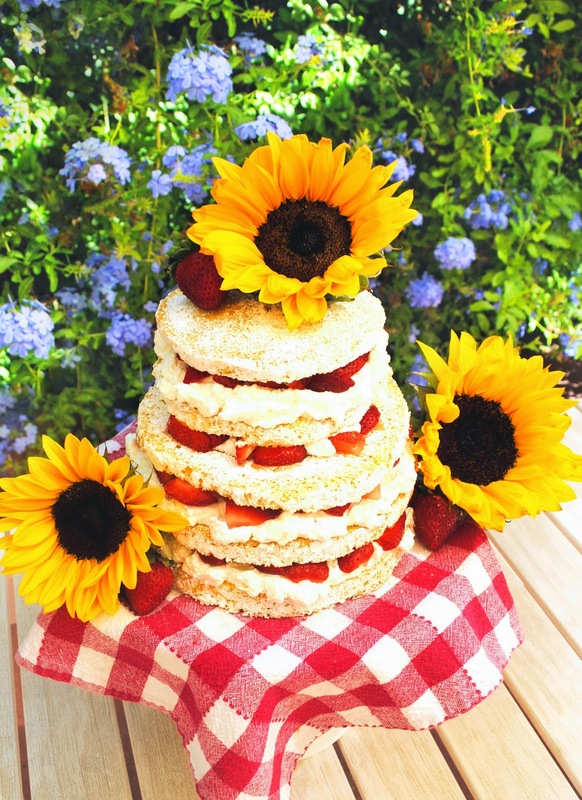 If you are looking for a simple dessert to make this holiday weekend, here's a quick recipe for Strawberry Shortcake that's so easy you probably have almost all of the ingredients already in your kitchen! 1. Preheat oven to 350 degrees. Grease and flour two 8 inch round cake pans or one 8 inch and one 6 inch pan. 2. Beat together eggs and superfine sugar with a mixer for approximately 10 minutes until the sugar is dissolved and the mixture is thick and creamy. 4. Slowly mix the dry ingredients into the eggs and sugar mixture until smooth. 5. Divide the mixture between the cake pan. 6. 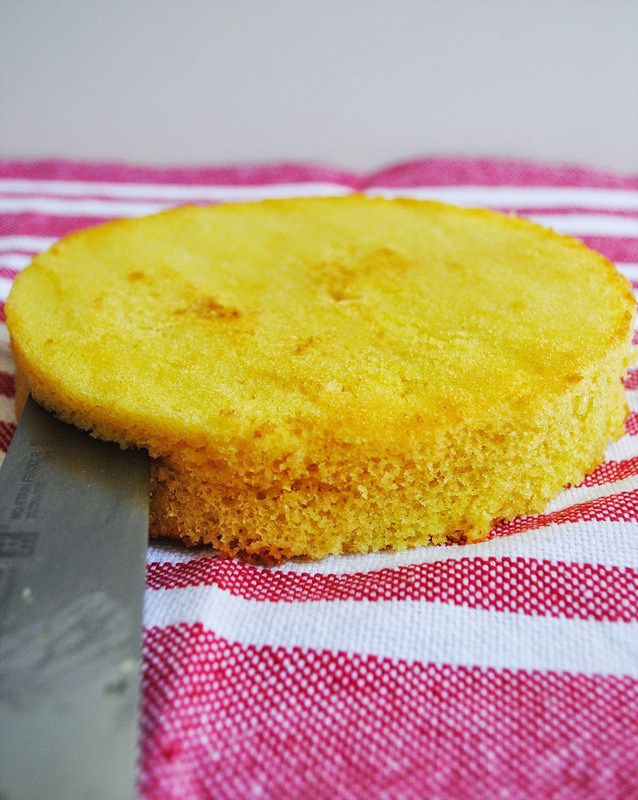 Bake 20-30 minutes (depending on the size of your pans) until you can insert a toothpick into the center of the cake and it comes out dry. 7. Remove pans from oven and cool upside down on parchment covered wire rack. 8. 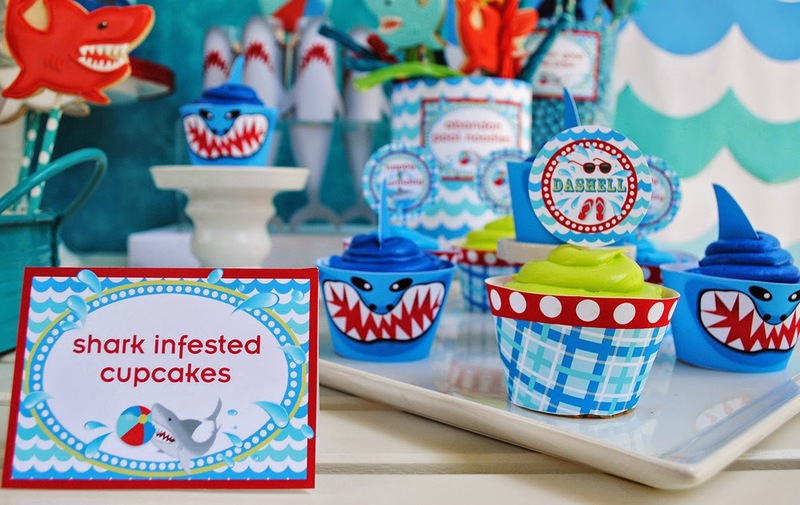 Once the cakes are cool. 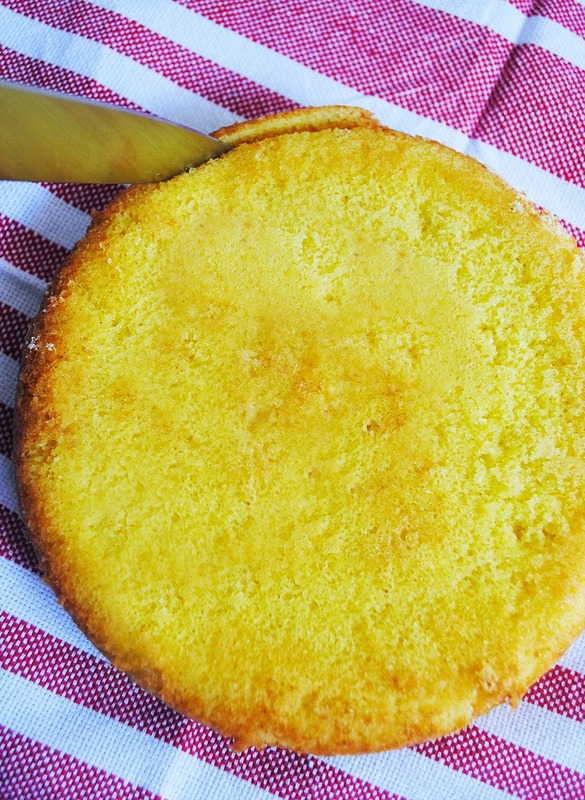 Carefully cut off the edge of each cake and then slice in half. 9. Sift a cup of powdered sugar onto a flat plate and carefully roll the edge of each of your cakes through the sugar and then set them aside. 10. With your mixer beat together the whipping cream, sugar and vanilla until thick. 11. 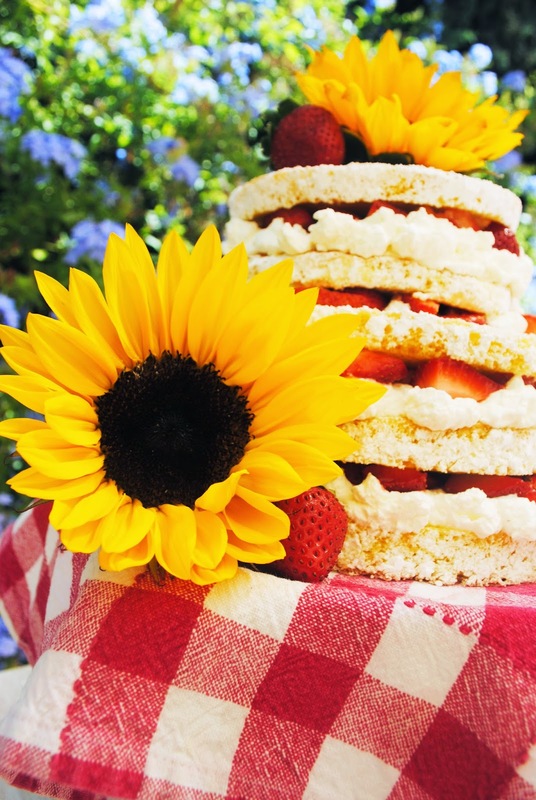 Assemble your cake by layering the cake with the whipping and sliced strawberries. 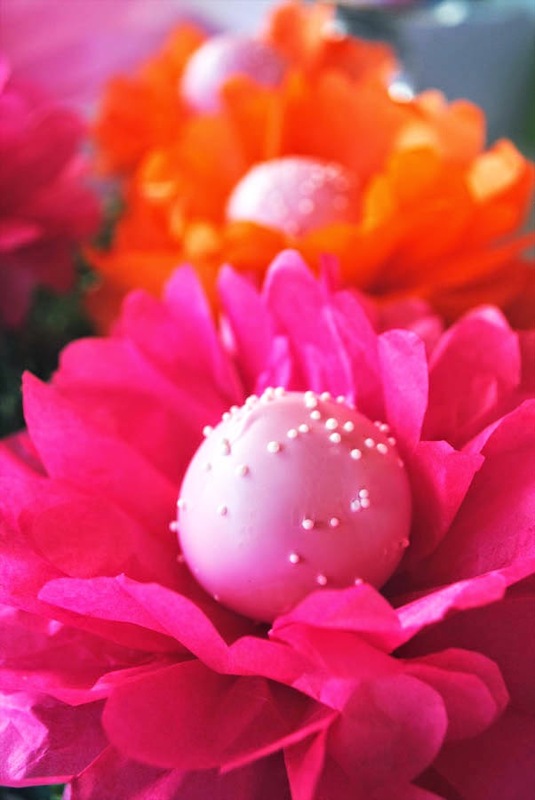 Garnish with fresh flower if you wish. And most of all ENJOY!! 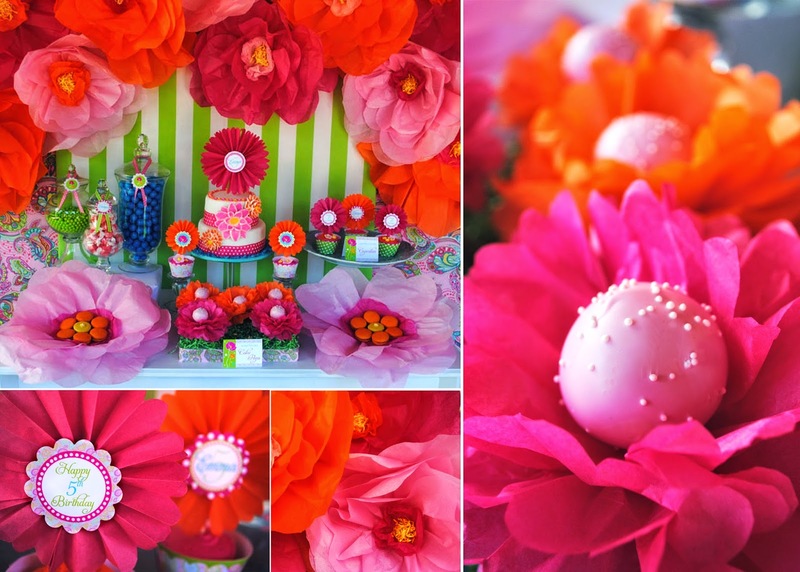 Hope you have a fabulous holiday weekend! 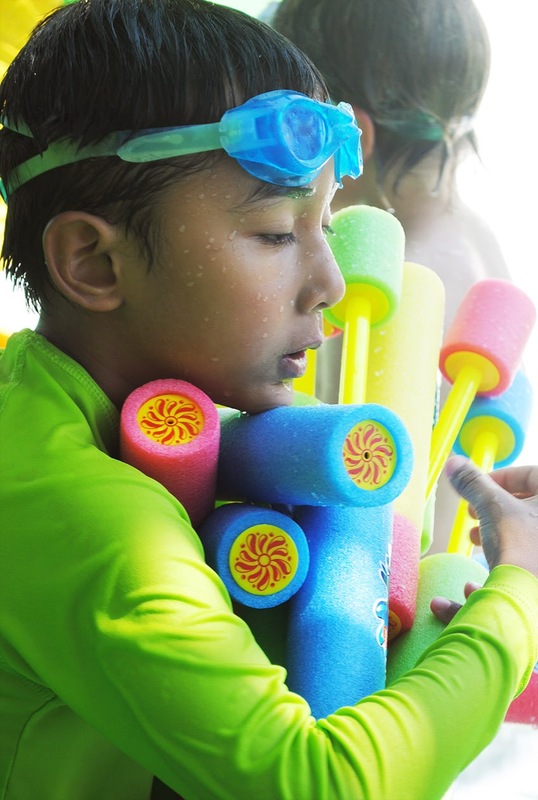 Are your children fired up to go back to school? 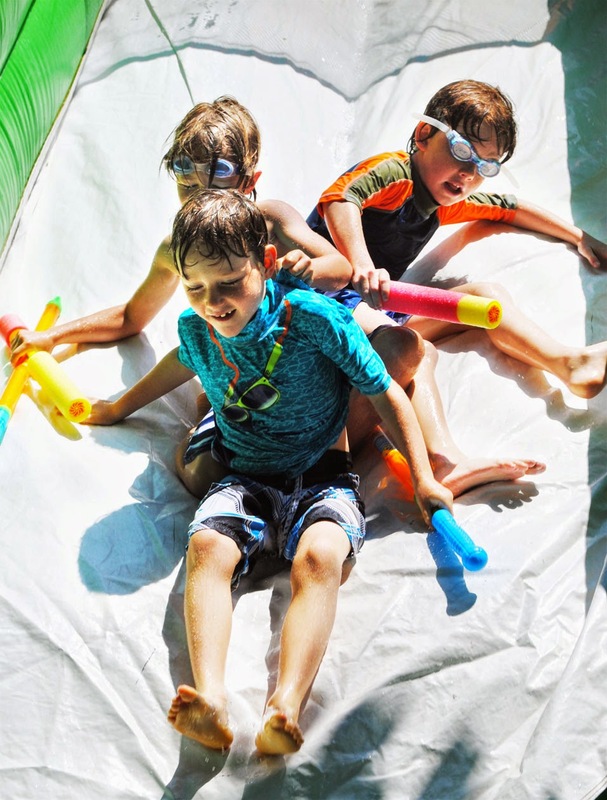 If so, help them blast back with our Free Alphabet Banner! Just click here to download the PDF. 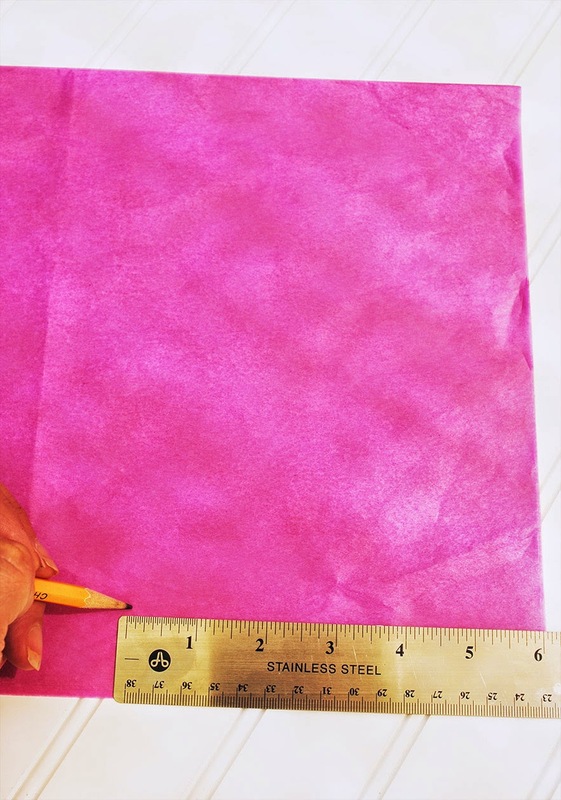 If you have never created a banner before, don't worry. 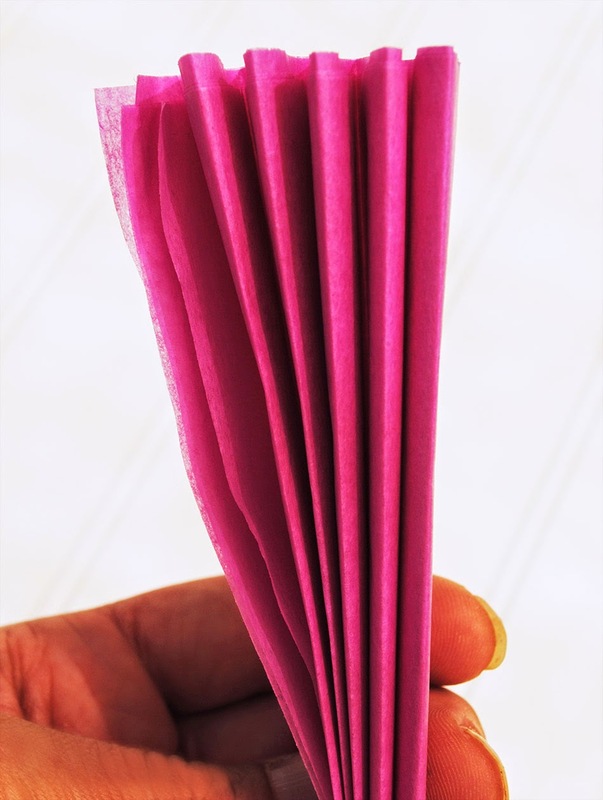 It's as simple as print, cut and string! 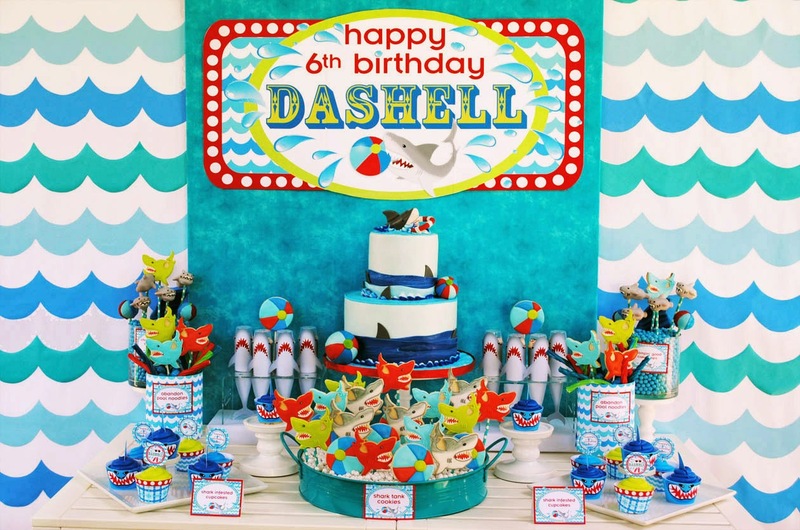 Just click here for our banner assembly tutorial. 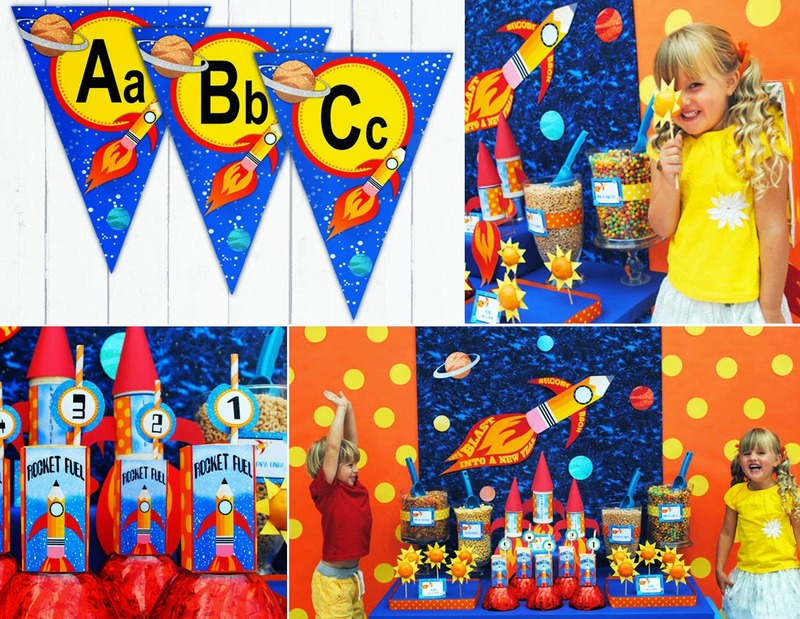 I hope your little ones have an out of this world new school year! 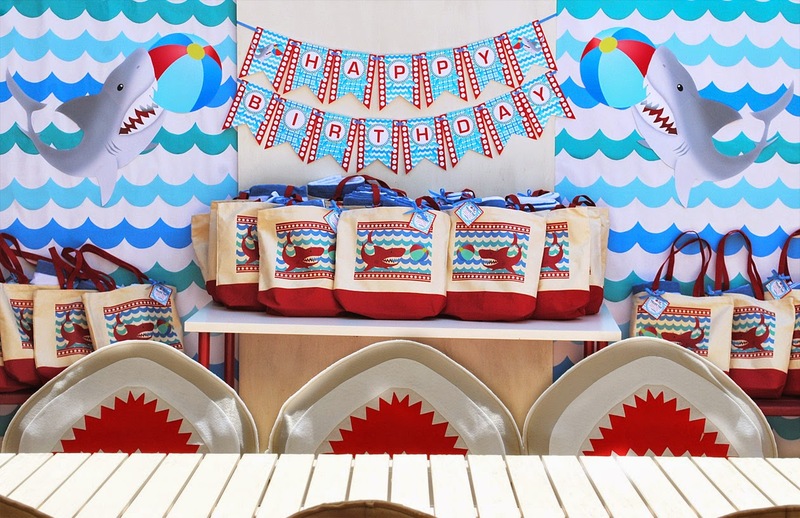 The our full Blast Back To School Printable collection can be purchased here in my shop. 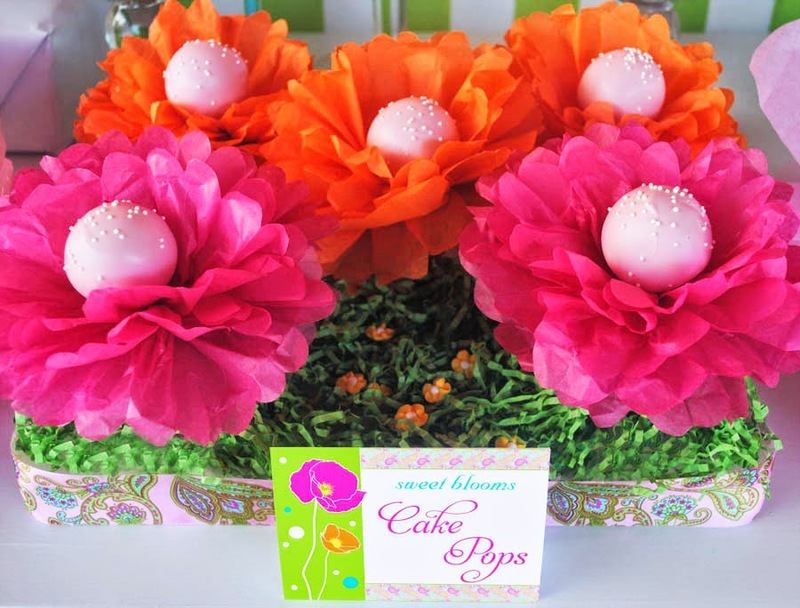 Cake Pop Flowers are a beautiful and easy way to bring a little fun to any Garden Themed Party! 1. 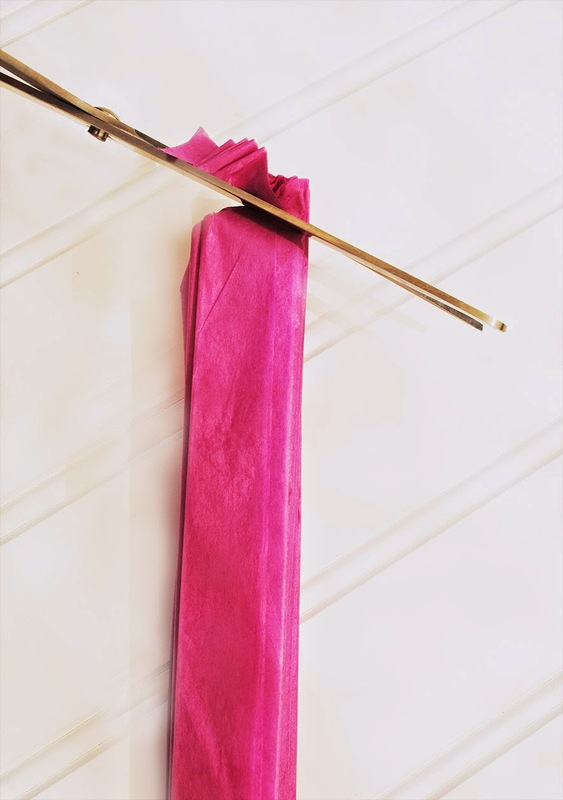 With 3 sheets of tissue paper folded in half lengthwise, measure out a 6 inch strip. 2. 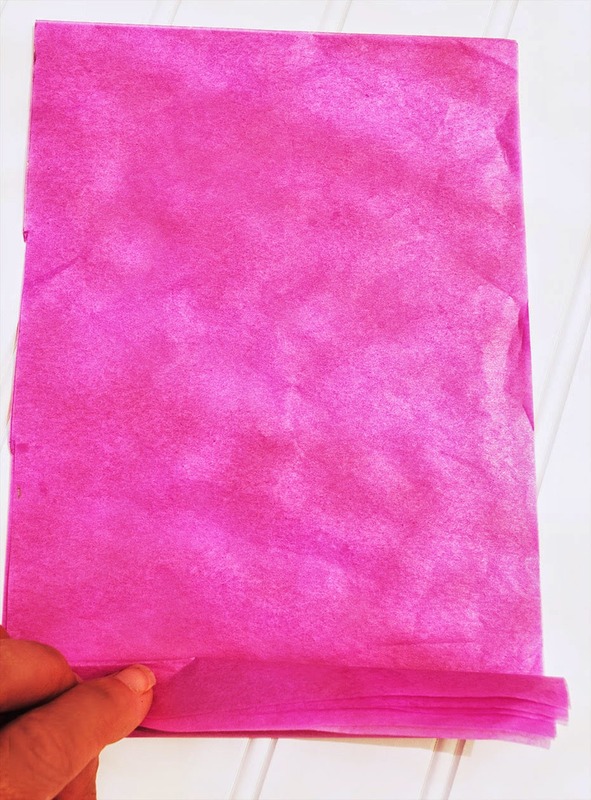 Cut the strip off from the rest of the paper. 4. 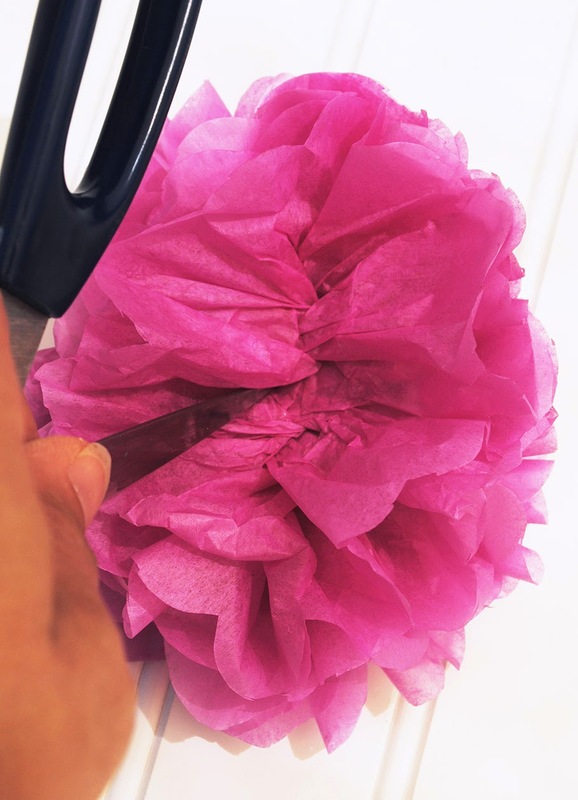 With your scissors round off each end. 5. 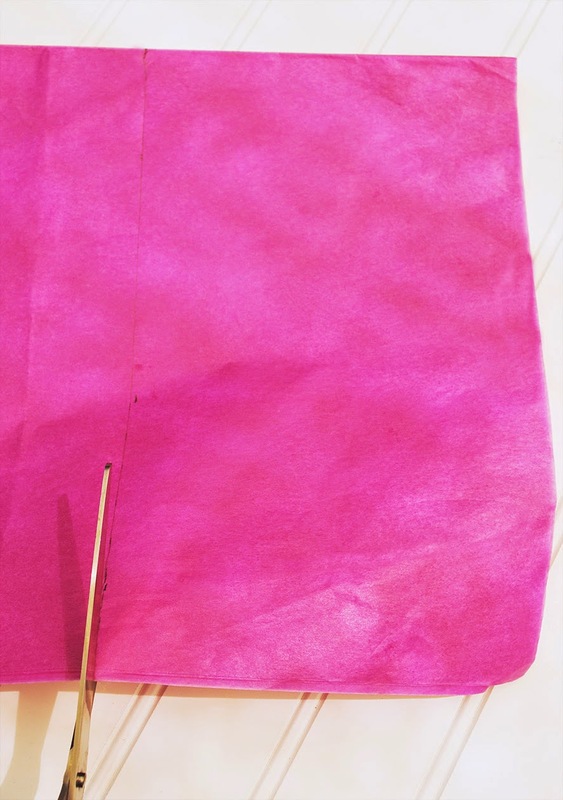 And then secure the middle of your pleated paper with a bit of wire. 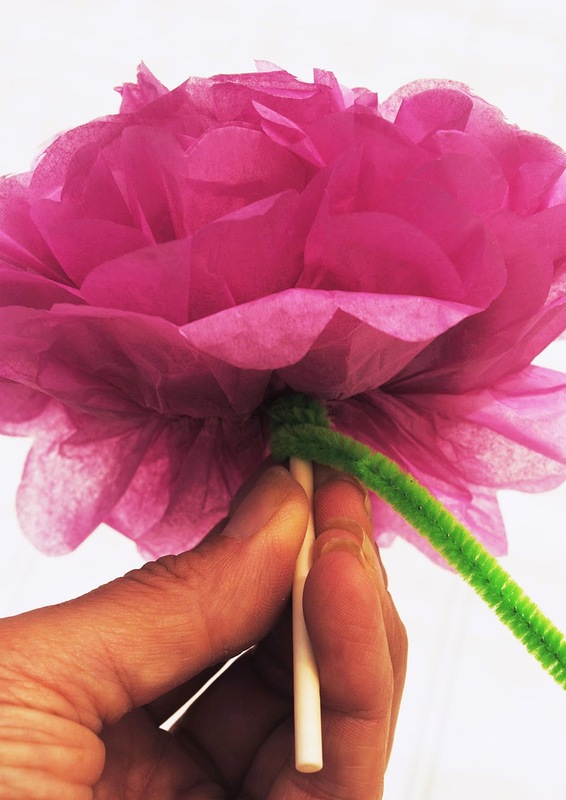 ...until you have a completed flower. Leave the center a bit flat. 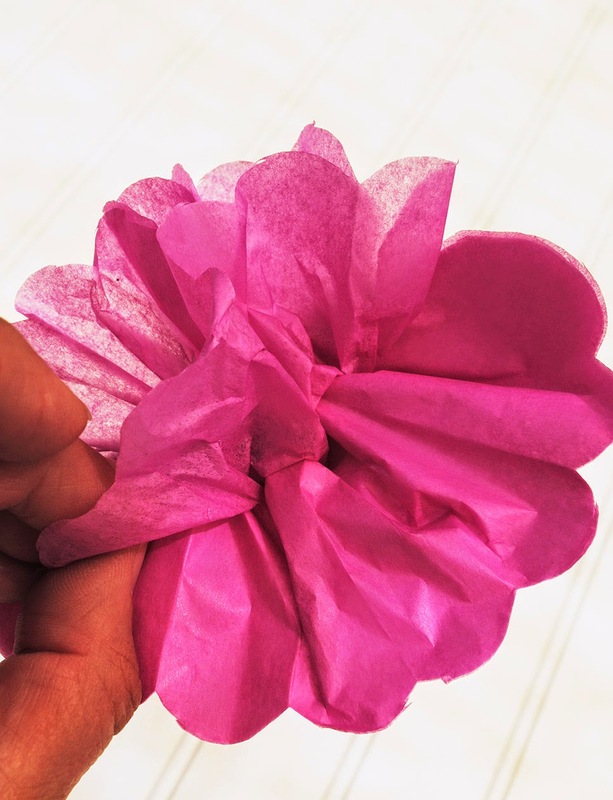 Do not fluff the tissue so that you have lost the center of your flower. 7. 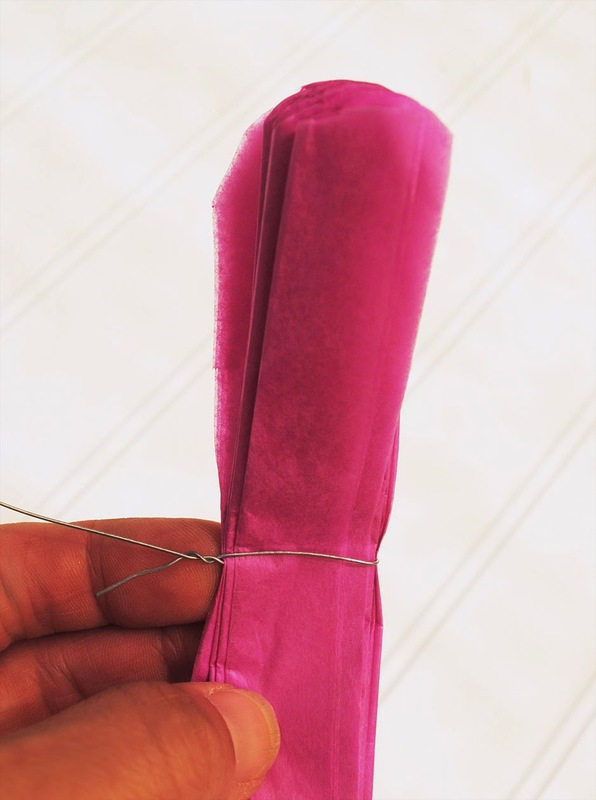 Take your scissors and using one of the blades pierce a hole through all the layers of tissue (just to the side of the center so as not to hit the wire). 8. 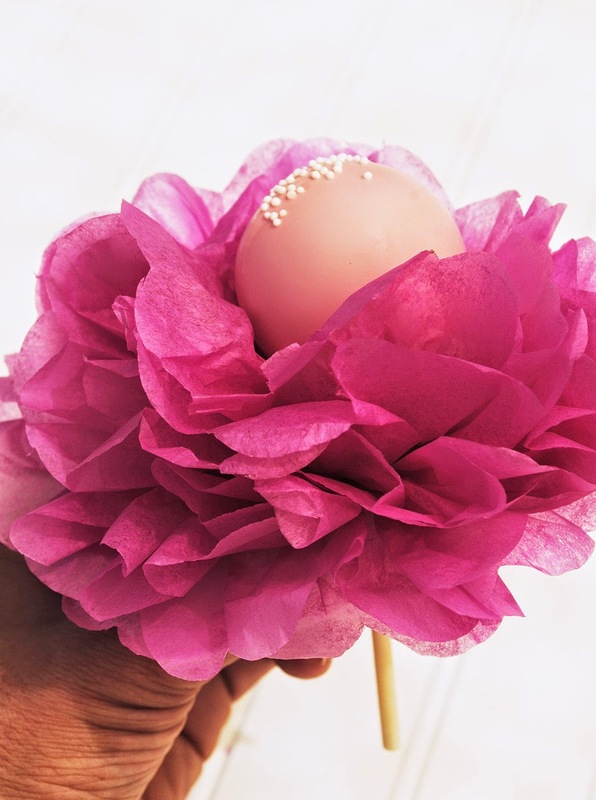 Slip the stick of your cake pop through the hole. 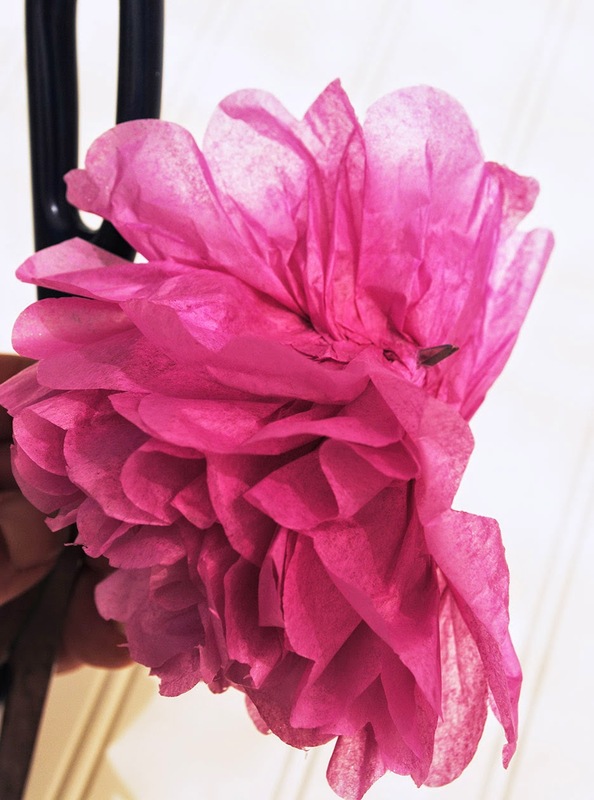 ...leaving about 1.5 - 2 inches clear at the bottom of the stick, so that you can insert the stick into styrofoam and stand up the flowers for your display. As the we enjoy the final weeks of summer, I find myself yearning to squeeze in one more dinner party. 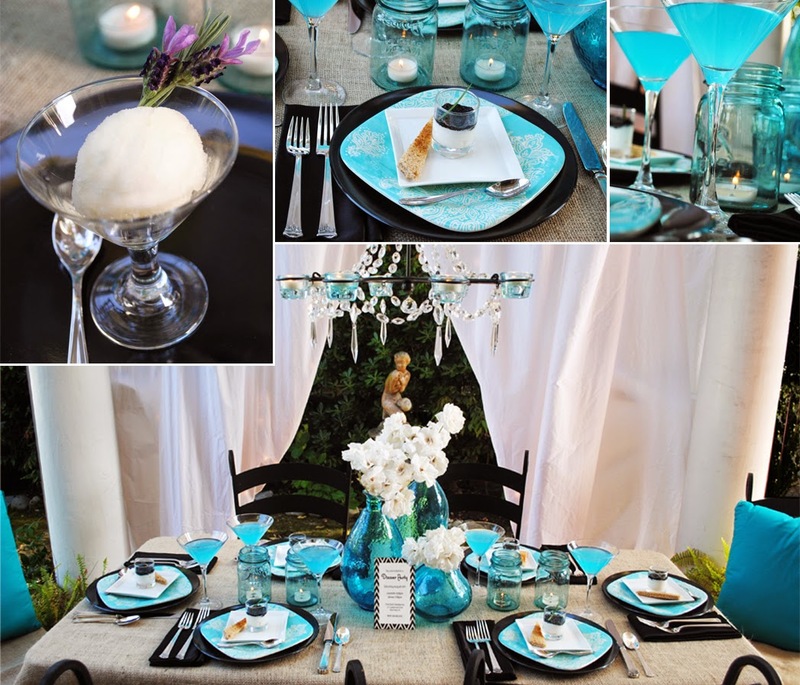 There's just something about dining al fresco, by candlelight, on a warm summer evening surrounded by good friends and yummy food. 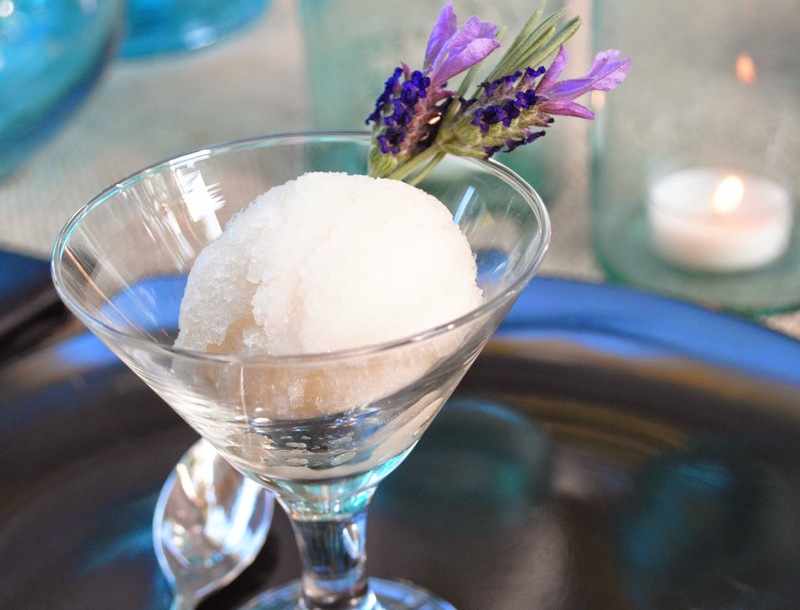 If you are also dreaming about a summer dinner party, this Lavender and Honey Ice Cream is delicious way to add just the right finishing touch to your menu. 1. In a sauce pan mix together cream, half and half, hone and lavender and bring to a gentle boil, stirring occasionally. Then remove from heat. 2. Cover the mixture and let sit for 30 minutes. 3. Use a fine sieve to strain the mixture and discard the lavender. 5. In a separate bowl, mix together the eggs. Once combine, slowly add one cup of the hot cream mixture. Pouring in a steady stream and continually whisking. 6. Add to the remaining hot cream mixture in your sauce pan and simmer (do not allow to boil). Continue to stir until thick. (At the correct thickness it should easily coat a wooden spoon.) Once thick, stir and simmer mix for 5 more minutes. 7. Pour the custard mixture through a sieve to remove any lumps and into a bowl. Set the bowl in an ice bath and continue to stir occasionally until the mixture completely cools. 8. Cover the bowl and chili for at least 3 hours. 9. 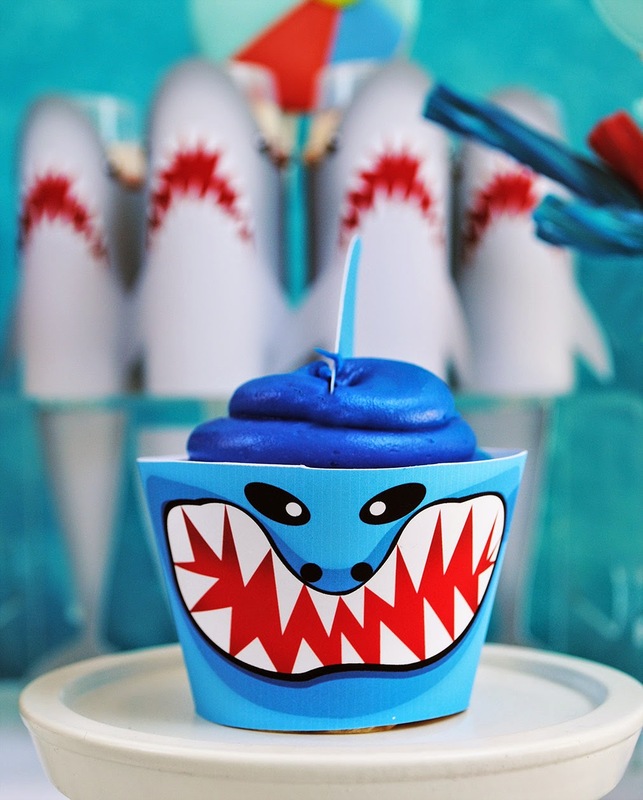 You can freeze the custard in an ice cream maker and then store in an airtight plastic container up to 2 weeks. 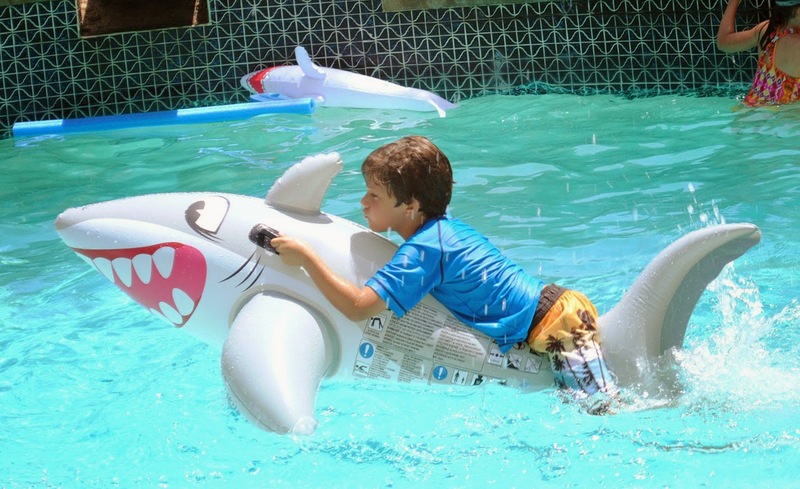 It's Shark Week! 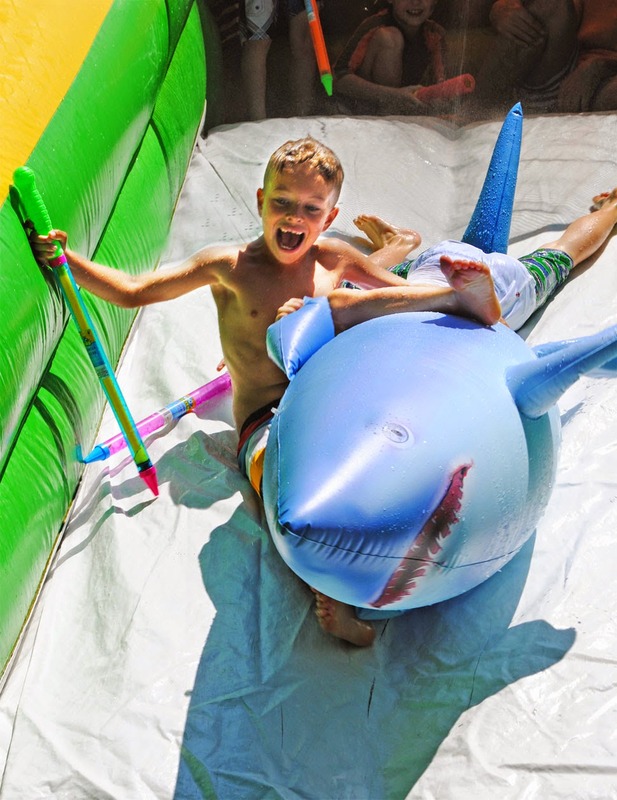 So I thought this was the perfect time to share my son's Wet 'n' Wild Shark Pool Party! 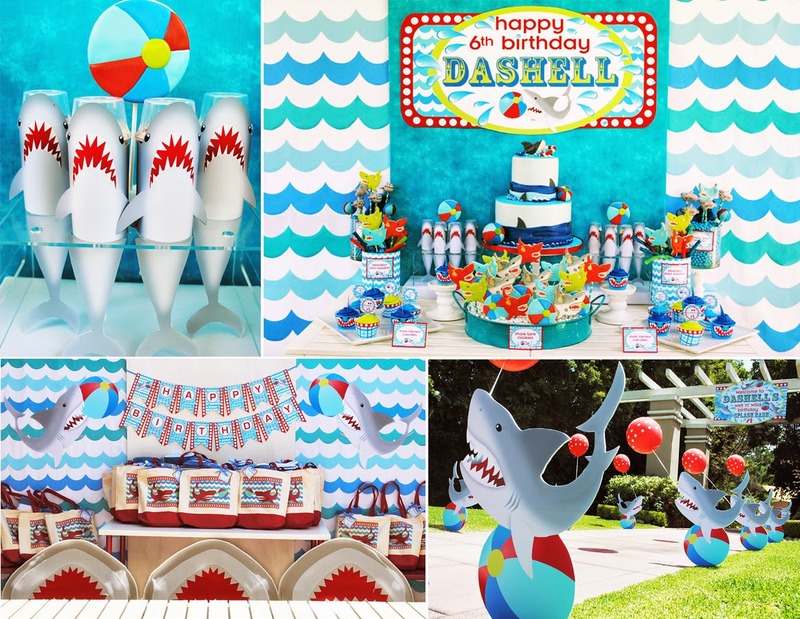 Dashell pleaded to have a pool party this year, which is perfect for him as I swear each summer he transforms into a fish. 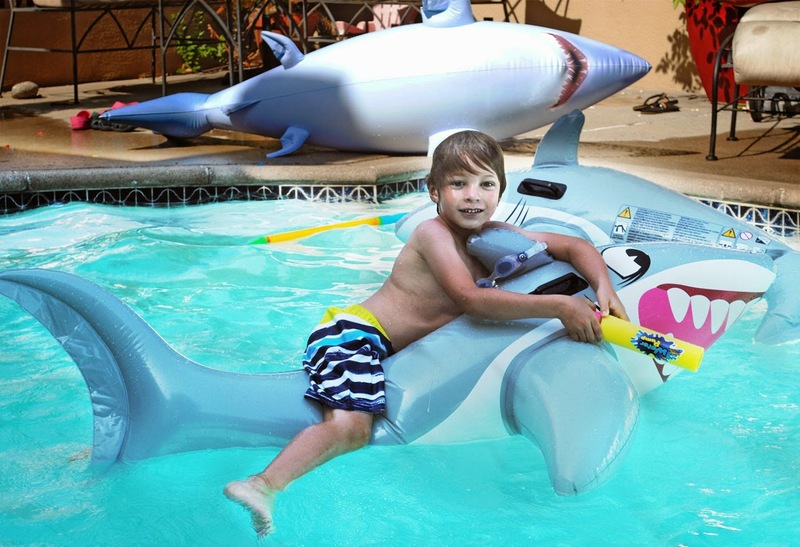 And when he realized that he could have not only a pool party but also a SHARK party, well, he was in heaven! 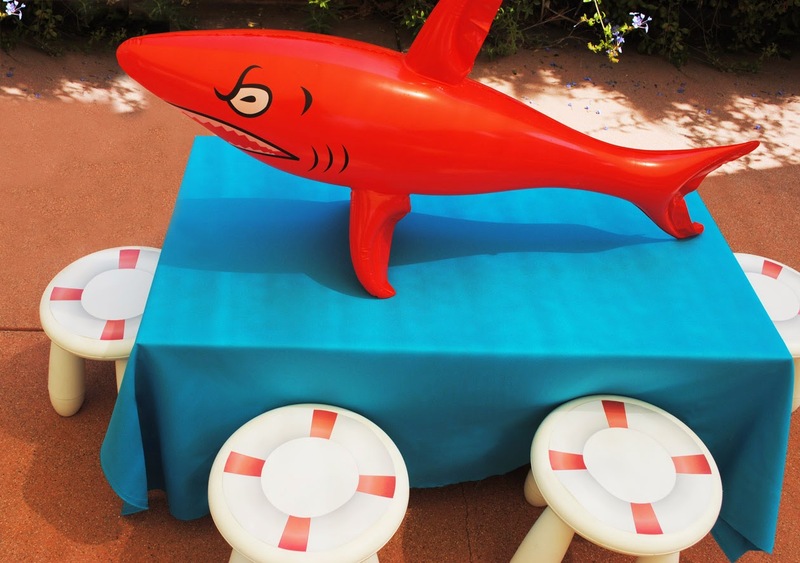 I just adore setting the stage for our parties from the moment the guests pull up in front of our house. 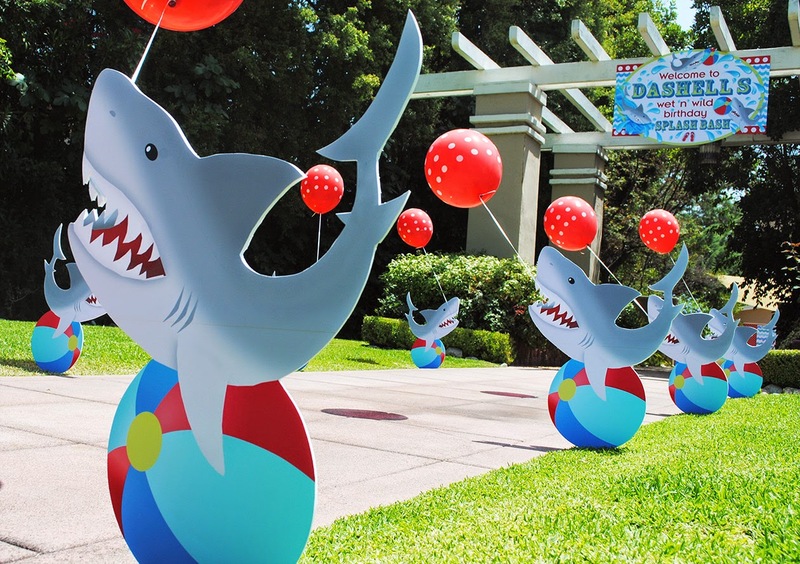 For this party, I lined driveway with a school of chomping sharks bearing polka dot balloons. 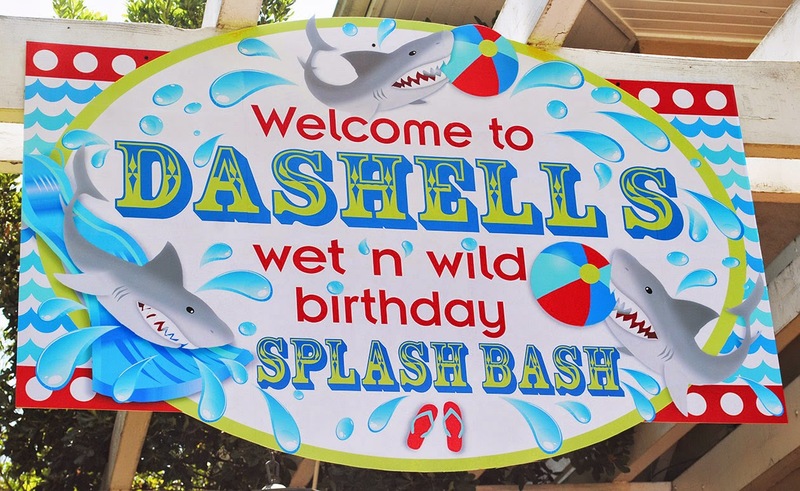 And to make sure there was no confusion as to our theme, I created a large sign welcoming everyone to Dashell's Wet 'n' Wild Birthday Splash Bash and hung it over our driveway. 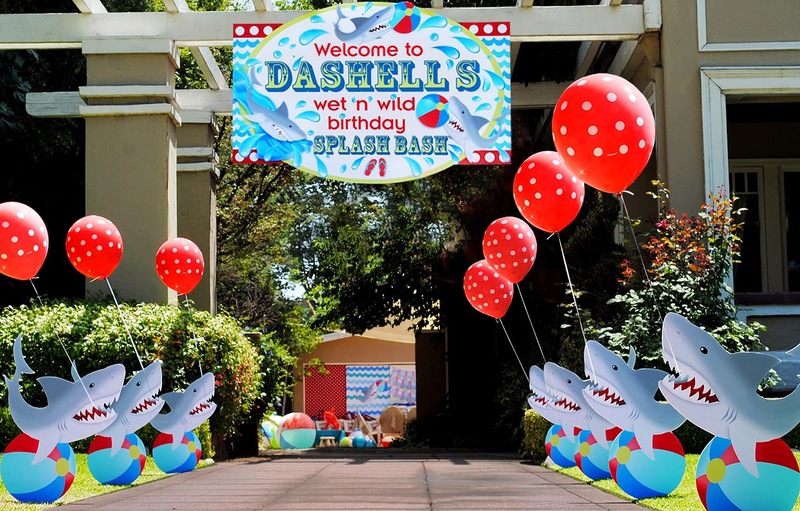 As the guests approached the backyard, they were greeted by a water themed backdrop, featuring large sharks flanking a happy birthday banner, tons of beach balls and scattered shark themed tables. 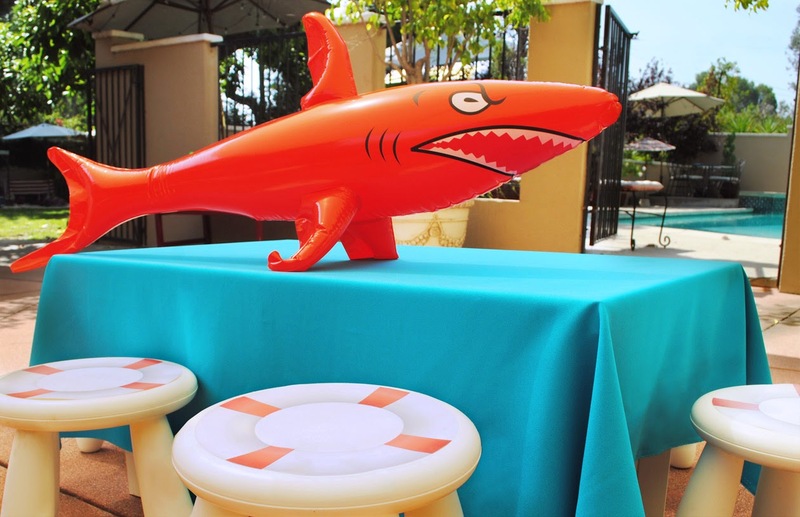 The chairs at the adult table were adorned with felt shark chair covers and for the kids tables, I created life preserver stool covers to help pull the seats into our theme. 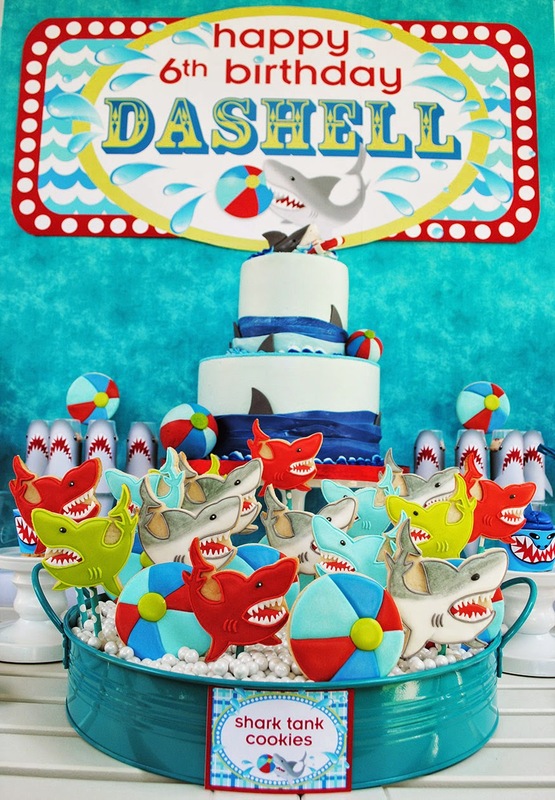 When it came to the dessert table, I went a little shark crazy! 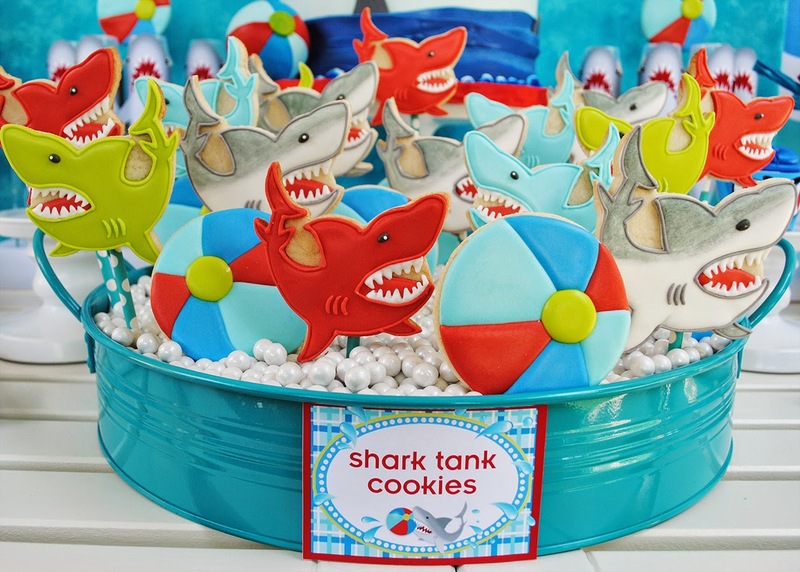 ...and a "shark tank" full of frighteningly beautiful cookies from Angela, at Oh Sugar! 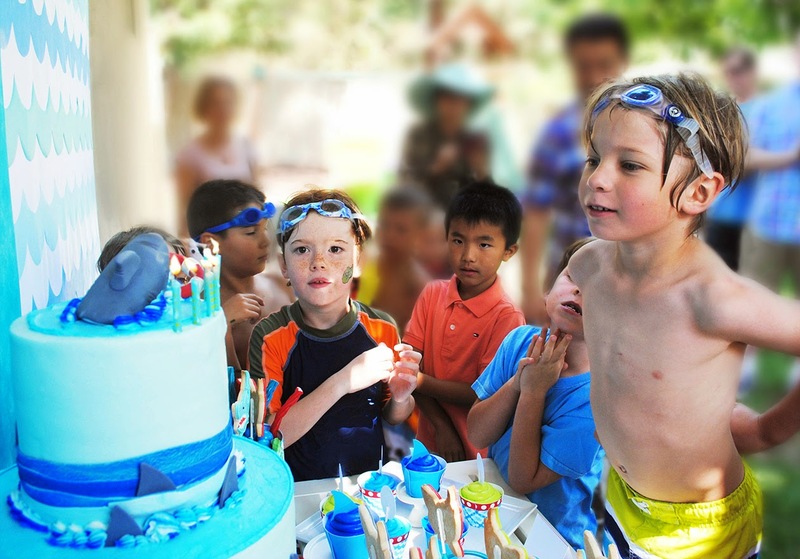 Events. I arranged some delicious filled licorice (these really were a hit!) 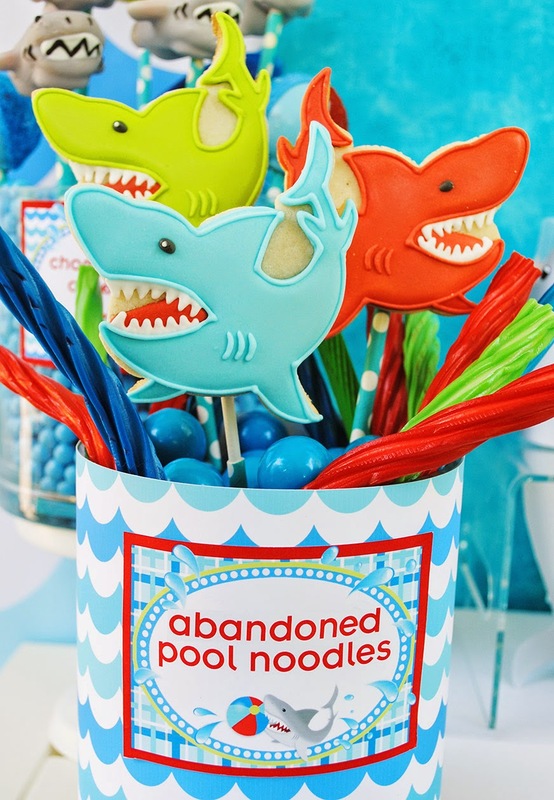 in glass vessels wrapped in coordinating paper, laced them with a few additional shark cookies and topped it all with a custom table label declaring them "Abandoned Pool Noodles". 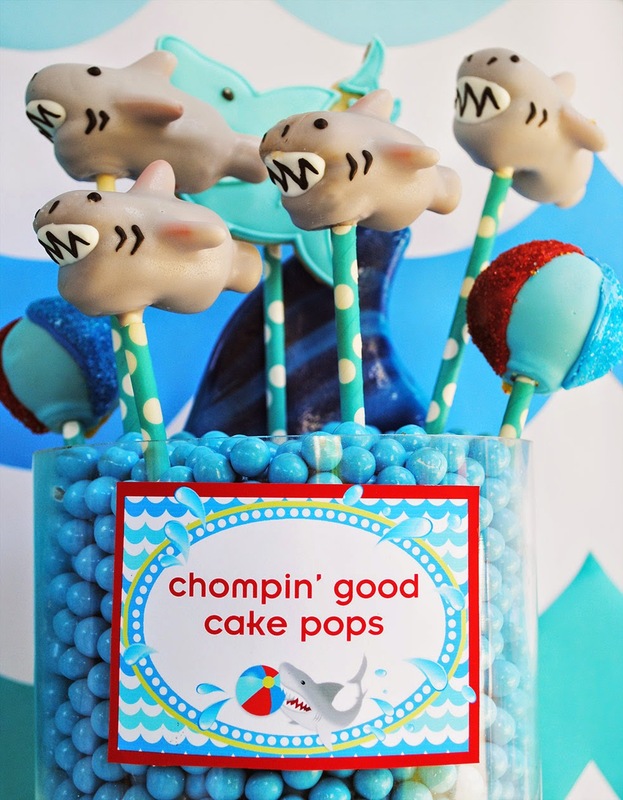 Sarah, of Mom's Killer Cakes and Cookies, created the most spectacular shark and beach ball cake pops. They really were "killer"! 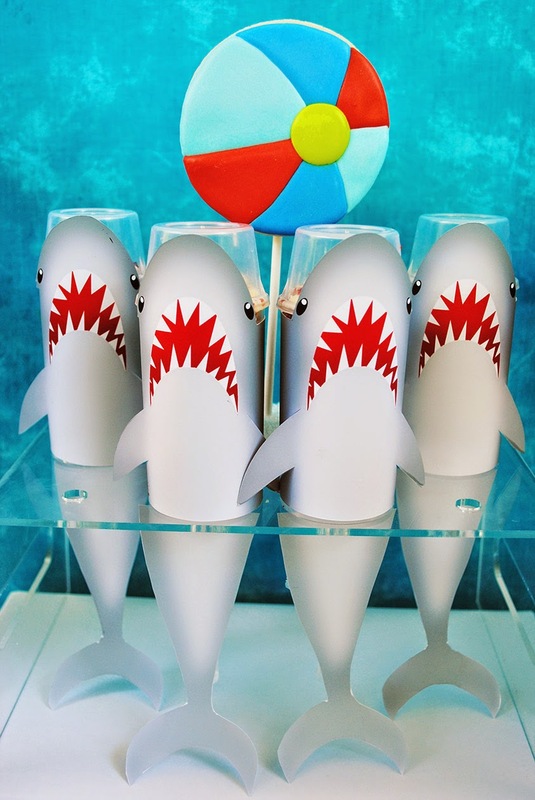 And just because I didn't feel that there were enough sharks on the table, I created custom shark wraps for my red velvet push pops. For the cake, I wanted something simple and graphic. 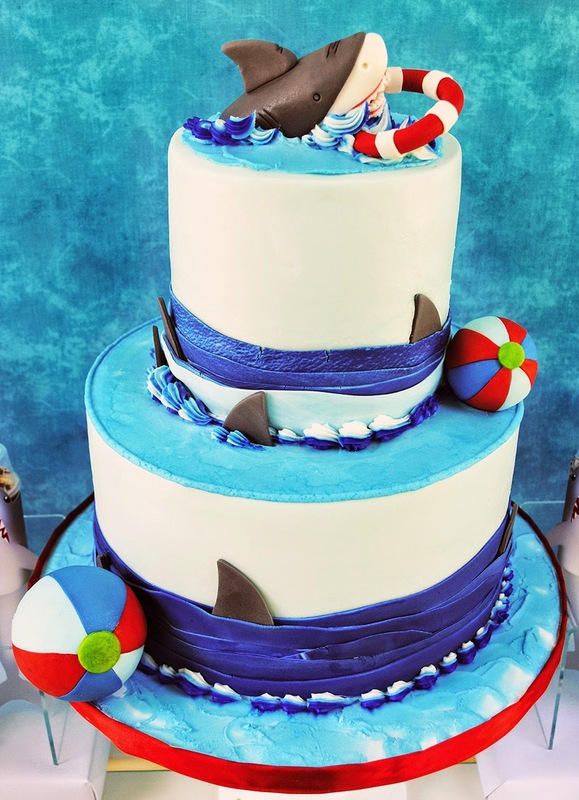 The ladies at Takes the Cake did an amazing job bringing my vision to life and Liz, from Les Pop Sweets, did a beautiful job with the fondant shark topper, fins and beach balls. 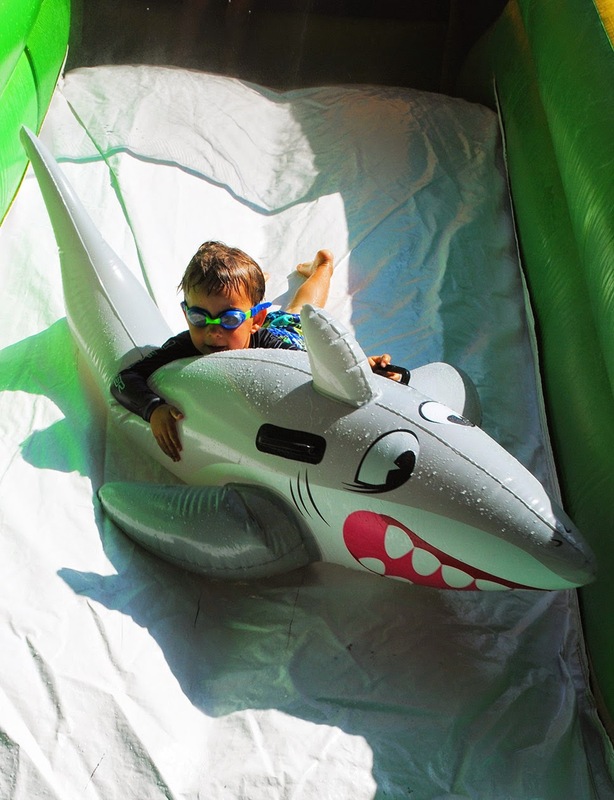 Through out the party I had tons of giant beach balls and inflatable sharks, 2 water slides and loads of squirt guns. 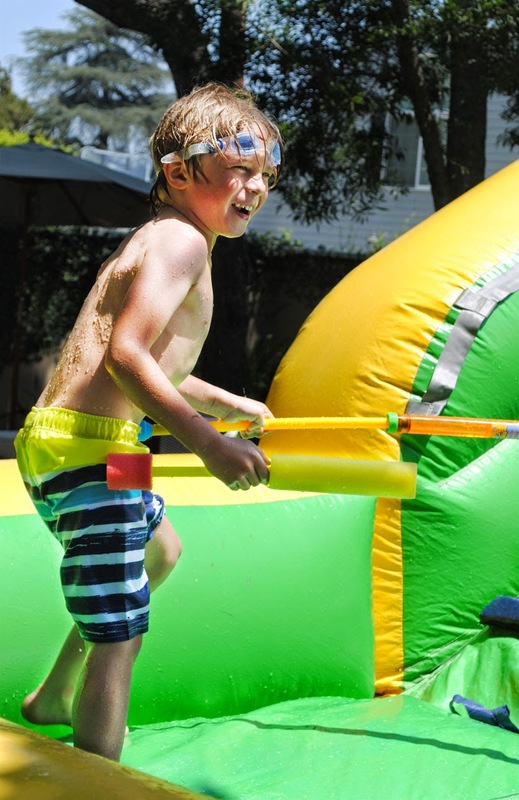 The kids ran wild! 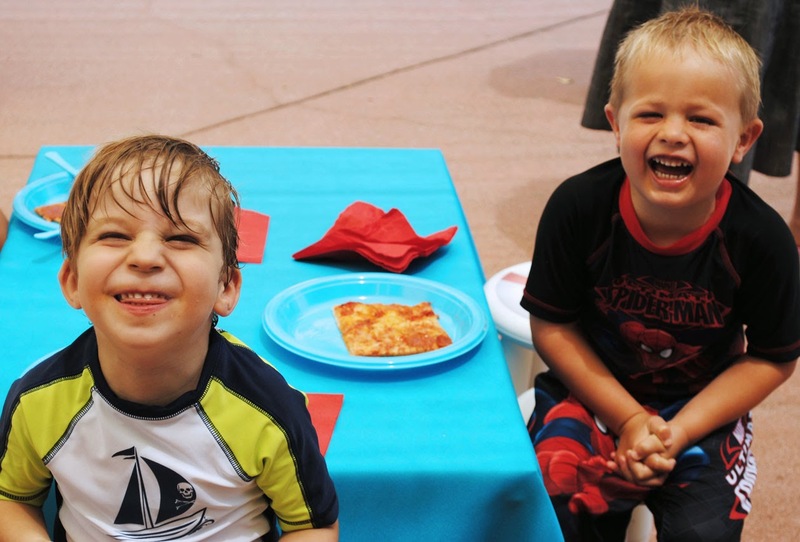 The afternoon was filled with lots of laughter and squeals of delightful "terror"! 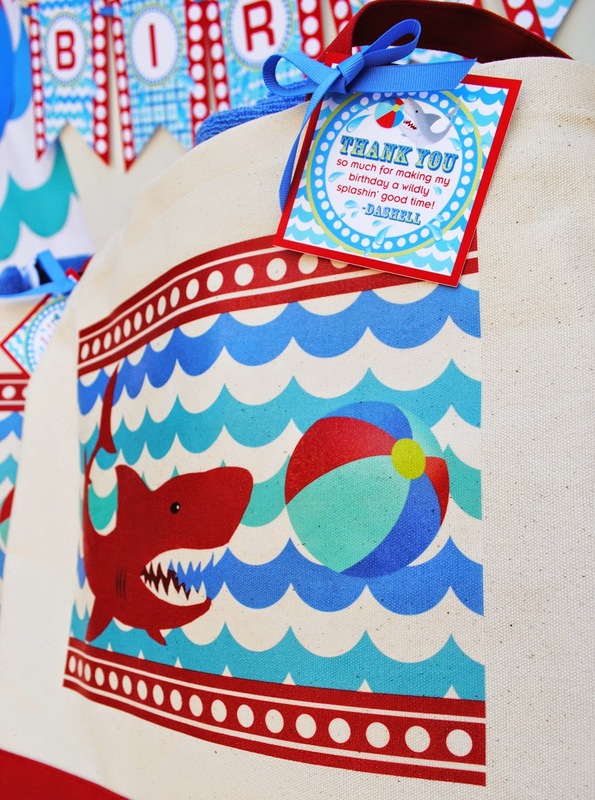 When they were all exhausted and it was time to dry off and pack up, we sent each guest home with a custom canvas beach tote, packed with a striped cabana towel so that the next time they decided to head into shark infested waters, they would be prepared! 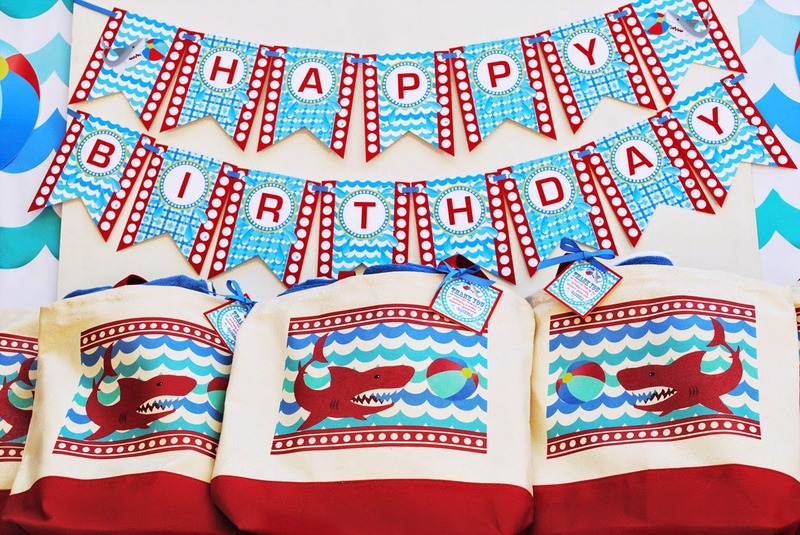 And I can't tell you how many parents have gone out of their way to tell me how much they absolutely love the bags. 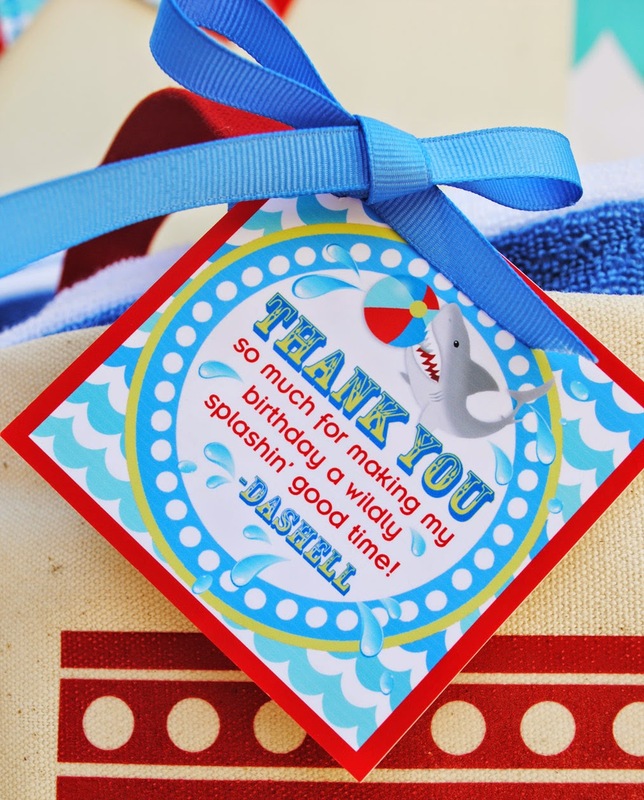 It always feels so good when you can give a favor that can be used and enjoyed over and over again.